Title: Back to Nature Aquariumguide. 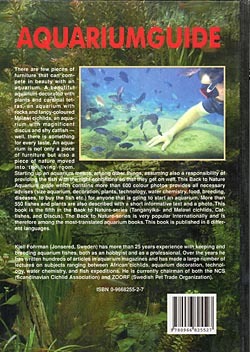 Chapters: The aquarium, Interior decoration, Water, Plants, Algae, Equipment, Food, Maintenance, Breeding, Diseases, Buying fishes, Live bearing toothcarps, Carp-like fishes, Characins, Killifishes, Labyrinth fishes, Rainbow fishes, Catfishes, South American cichlids, Central American cichlids, Malawi cichlids, Tanganyika cichlids, Other cichlids, Other fishes, Plants, Literature, Index. Species descriptions: More than 430 fish species. Each species is described with scientific name, family, trade name, range, temperature, maximum size, water (pH), minimum aquarium, difficulty, comments (food, breeding behavior, aggressiveness, suitable decoration etc.). More than 40 plant species. Each species is described with scientific name, family, origin, height, light, temperature, water (pH), growth, difficulty, comments. Published in: English, German, Swedish, Danish, Norwegian, Dutch, Hungarian and French. There are few pieces of furniture that can compete in beauty with an aquarium. A beautiful aquarium decorated with plats and cardinal tetras, an aquarium with rocks and fancy-colored Malawi cichlids, an aquarium with magnificent discus and shy catfish - well, there is something for every taste. An aquarium is not only a piece of furniture but also a piece of nature moved into the living room. Starting up an aquarium means, among other things, assuming also a responsibility of providing the fish with the right conditions so that they get on well. 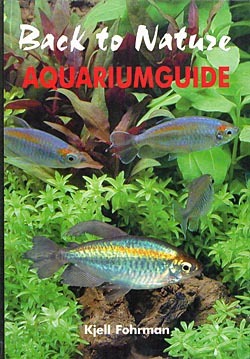 This Back to Nature Aquarium guide which contains more than 600 color photos provides all necessary advises (size aquarium, decoration, plants, technology, water chemistry, food, breeding, diseases, to buy the fish etc.) for anyone that is going to start an aquarium. Kjell Fohrman (Jonsered, Sweden) has more than 25 years experience with keeping and breeding aquarium fishes, both as a hobbyist and as professional. Over the years he has written hundreds of articles in aquarium magazines and has made larger number of lectures on subjects ranging between African cichlids, aquarium decoration, technology, water chemistry, and fish expeditions. He has been and is still very active in hobby and professional associations and clubs, for example 20 years in the Scandinavian Cichlid Association (NCS) including four years as president and editor for Ciklidbladet (NCS magazine). He has also been president of the Swedish Pet Trade Organization (ZOORF) and the Scandinavian Pet Trade Union (SPTU).